Sheryl Olitsky, is a former Fortune 500 corporate marketing executive and the wife and mother of rabbis. Atiya Aftab, is a former New Jersey Deputy Attorney General and the immediate past president of the NJ Muslim Lawyers’ Association. Together, they launched the Sisterhood of Salaam Shalom nationally in 2013 and convened the organization’s first annual conference in 2014. The number of attendees has since mushroomed six-fold. The Sisterhood is the fastest-growing, grassroots movement of Muslim and Jewish women, with over 150 chapters, in more than 25 states, Washington, D.C. and Canada. More than 1000 women have put their names on the waiting list to join. Its members are secular and religious Jewish women with German, Eastern Europe, Middle Eastern and Sephardic ancestry, and Muslim women of Turkish, Egyptian, Lebanese, Syrian, Iraqi, Iranian, Pakistani and Palestinian descent. The Sisterhood consists of small groups of equal numbers of Jews and Muslims who meet regularly to share Shabbat dinners and iftars (meals eaten to break fast during Ramadan), get a better understanding of each other’s lives and faiths, concentrate on their similarities, respect their differences in a safe environment, without interference from the presence of men, and perform acts of tzedakah and sadaqa (note the similar pronunciations), one of which included helping Syrian refugees find shelters. The Mincha and Asr prayers being held side-by-side. Mincha was led Andrea Hodos, creator of Moving Torah Workshops—physical, spiritual and intellectual. The Asr afternoon prayer was led by Tahera Ahmad, Director of Interfaith Engagement and Associate University Chaplain, Northwestern University. Photo credit: Amy Stone. I’ve been studying sacred texts for a long time. When I was small, I learned to read Hebrew, and deciphering the Chumash – the books of the Torah – was a favorite pastime. Suddenly, the words that I’d memorized and chanted with my parents were real, written in black and white in front of me with letters that had formerly been squiggles. As I learned to read more advanced texts, including Rashi’s commentary and his ubiquitous “Rashi” script, I continued to find thrill in unearthing deep divine secrets and multi-layered thoughts beyond words of black and white. 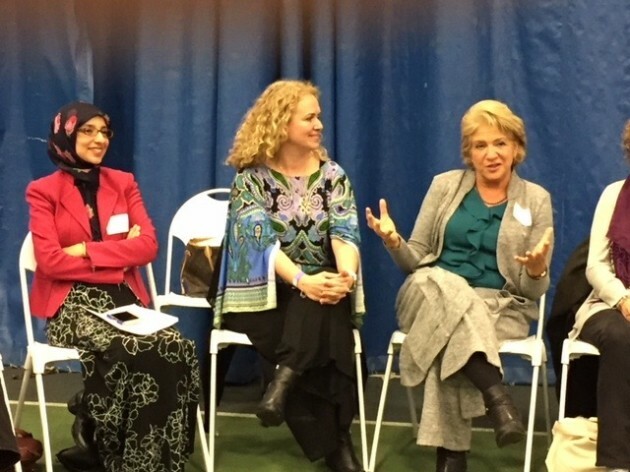 It was an interesting orchestration of the universe, then, that at last Sunday’s incredible gathering of Muslim and Jewish women, the “Sisterhood of Salaam Shalom Conference,” I turned back to my textual roots. Studying stories that we’d all known all our lives. Explored through the lens of the other. Unlike the Jewish textual studies I’ve come to criticize in my current exploration of Jewish communities today, which are so focused on source sheets that lived experience seems far—this was real. It was embodied. It was experiential. It was a sisterhood, coming together to discuss how the texts that guide our lives also guide the lives of our sisters. Together we uncovered the story of our foremothers, Sarah and Hagar, and their rift. We discussed the moments of desperation, fear and sadness that occur when there’s a sense of scarcity. We learned the stories, sure. But we explored how they relate to our worlds. When I selected the next workshop for its title, “Feminine Power in Storytelling”, I was unaware that I was heading into yet another text-based Chavruta [paired-study] session. This time, we uncovered and compared the story of Moses, taking refuge in the Nile river as a small baby, followed by his sister, and adopted by Pharoah’s family. In the Koran, it’s Pharaoh’s wife; in the Torah, it’s Pharaoh’s daughter. My group of four women marveled at the small differences—like that in the Koran Moses’s sister Miriam is told by her mother to follow the baby along the Nile; while in the Torah she takes her own initiative. But more than those differences, we explored our commonalities—like the unshakeable faith, displayed by Miriam, by Moses’s mother, by Hagar, by Sarah, that reminds us that no matter how events shake out, there is always a promise from God at the end of the tunnel. After our study, we heard the texts chanted in the original Arabic and Hebrew. As a special treat, in both the Koran and Torah, we were introduced to modern versions, poetry that did not sugar-coat the struggles of these matriarchal women, describing Hagar’s thirst in the desert, Miriam’s faith along the riverbank, and the feminine power we continue to carry within ourselves. The pièce de résistance was the afternoon prayer. Two women stepped forward. One, in front of a sea of prayer rugs. The other, before a mass of Jewish women clutching sheets with the Mincha Prayer written on them. We began. “Ashrei Yoshvei Veitecha”—happy are the ones who dwell in the house of God, chanted the women on one side. Moments later, as we stepped into the silent Amidah prayer, our Muslim sisters began the chant, the Muslim call to prayer. Prostrate on the ground, they continued to pray as we bent our knees and bowed in the Amidah. The same God. The same prayer. Different words. Different traditions. We completed our Amidah and began the Kedusha, singing “Holy, Holy, Holy,” sounding the call of the angels, as our Muslim sisters continued in their prayer on their sacred rugs. And then, we came together. “Oseh Shalom Bimromav,” “He who makes peace in the heavens,” we chanted, blessing the One above and all of us below. In that final Kaddish, I looked at the woman to my left and smiled. Her blue headscarf didn’t look that different from the ones worn by my mothers and sisters. Her voice sounded like mine when I go deep into a prayer. And although I know that perhaps we each have our own sense of the Divine, I knew that we are both on the same search, the same journey, the same prayer as we continue into finding truth as women thirsting for connection to the Divine. Two women at the “Communicating Contradictions: Lean In, Rise Up, Jump In, and Listen!” workshop. Heba Macksoud of South Brunswick N.J. (right) sought advice after verbal bullying twice in one week. Photo credit: Amy Stone. Oh, man. Oh, woman. Oh, Sisterhood of Salaam Shalom (SOSS). This Muslim-Jewish business is a minefield. Why had one of the closing session “Panel of Change Agents” thrown this bomb into the crowd? Were other Jews as unnerved as I was? I’m deeply critical of Israel’s racist treatment of Palestinians and question what Zionism means after 1948. I criticize Israel to other Jews, including devoted AIPAC supporters. But when non-Jews—especially those I don’t know—attack Israel, I feel in hostile territory. Looking back, I realize how moved I was by Sen. Cory Booker’s charismatic message of love, delighted by his self-description as “the big goy guy who wants to know what the parsha is each week.” When Booker calls for love manifested in action—“We are not defined by what happens to us but how we choose to react”—we cheer. SOSS co-founder Sheryl Olitzky tells the 600 women filling the giant gymnasium floor that we are the largest gathering of Muslim and Jewish women in America, ever. We come from all over the U.S. and a sprinkling from Canada. Inspired by Booker’s charisma, I hadn’t emotionally absorbed other speakers’ warnings and cautionary tales of discord. The workshop on the power of grace arose out of conflict between the session co-leaders at a chapter meeting introducing Jews to the complexities of “Ashura.” Meaning the tenth of the month, one aspect of Ashura is the multi-ingredient dessert also known as Noah’s pudding. Commemorating Noah on that date, it is made by both Muslims and Christians in the Middle East as a symbol of sharing and love. For Turkish-born co-leader Arzu Kaya-Uranli, a Sunni Muslim, journalist and lecturer, Ashura suggests a delightful and symbolic treat. But for Shia Muslims, in the words of Kaya-Uranli, it’s “a doomsday moment.” Ashura, the tenth day month of Muharram, commemorates the massacre of the Prophet Mohammed’s grandson Husayn, precipitating the great Sunni-Shia split. One woman’s dessert is another’s catastrophe. SOSS’s Olitzky had just counseled: “Avoid complicated discussions till you’re ready to listen with your heart, not your ear. It takes time, work to become a compassionate listener.” Oh, Yahweh. Oh, Allah. Give the sisterhood strength. Listening with curiosity comes a lot more easily to me than compassion. 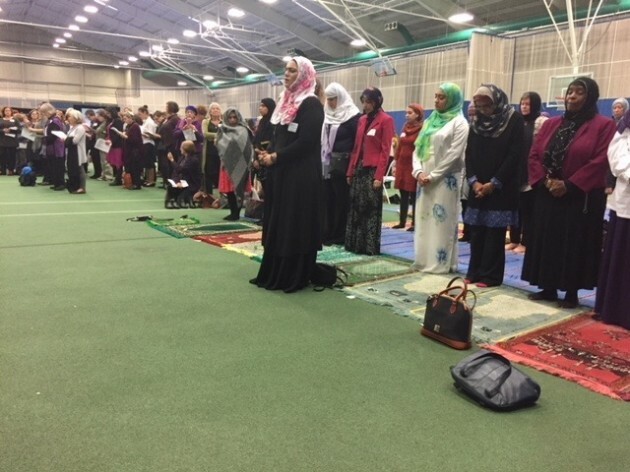 And a day spent in the company of hundreds of Jewish and Muslim women connecting with each other makes me feel the Sisterhood of Salaam Shalom is on the right track. Maybe we need an SOSS hotline when sisterhood hits snags. Or maybe in the great tradition of the women’s movement consciousness-raising groups, we women will rewrite the rules and figure things out. The way the Charlotte chapter’s Weiman put it: You start with the initial excitement of love. Then that cools down to like. Then divorce. 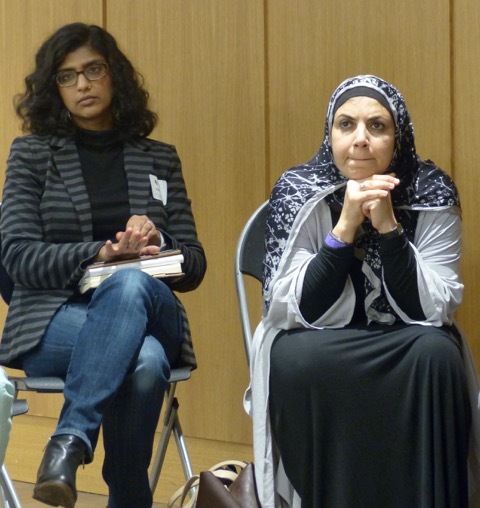 What we’re talking about in our Muslim-Jewish sisterhood is commitment. This post was corrected on Dec. 20, 2017, reflecting clarifications submitted via email by Arzu Kaya-Uranli and other members of the SOSS Charlotte Chapter. Workshop on “Graceful Living With Difference and Disagreement.” Faaiza Subhani, SOSS Central Jersey Chapter (left), and workshop co-leaders from the Charlotte, N.C., Chapter, Arzu Kaya-Uranli (center) and Racelle R. Weiman (right). Photo credit: Amy Stone. Piercing blasts of the shofar rang out on a recent Sunday morning in the gymnasium-turned-sacred space where more than 600 American Jewish and Muslim women gathered for the Sisterhood of Salaam Shalom’s 4th Annual Leadership Conference. The blowing of the shofar, explained Sheryl Olitzky, executive director and co-founder of the Sisterhood, was a wake-up call for our souls. It was not calling us to repent for our sins, as prescribed in traditional Judaism, but rather “to rise up against hate”—this year’s Conference theme. I came to the Conference, held at Drew University in Madison, NJ, curious and wary, not knowing what to expect from a day promoted to wage peace against anti-Semitism and Islamophobia, using the tools of “harmony and interfaith advocacy.” Really? The agenda, program, and more than 20 workshops offered seemed loosey-goosey to me. But, I would change my mind by day’s end. I am a feisty, culturally Jewish feminist—neither a Zionist nor one who agrees with all current Israel politics—but as a person who experienced anti-Semitism in my youth and discrimination in my chosen career path. Growing up in a small town in Upstate New York, where we were four Jews and one black in my class of 150, I was bullied as a kid and called “Pinocchio” with my big nose (I was too young for anyone to call me “Shylock”) and, as a teenager, excluded from playing competitive tennis at our rival’s country club outside of Albany. Those were stinging unforgettable moments. And, while I had had no relatives who perished during the Holocaust and my father was not a military veteran—something he regretted all his life—after the War there were a number of displaced persons in our town, aka “DPs” who had heavy European accents. They sometimes hid and sometimes exposed the concentration camp numbers tattooed on their arms, depending upon where they were and whom they were with. When it came time to choose my high school senior thesis topic, it wasn’t a difficult one. I titled the project, “Discrimination against Blacks and Jews in Housing, Education, Colleges and Universities in New York State.” I naively thought it would be a small project. The year was 1962. A few years after, during the late 60’s and early 70’s, the second wave of feminism was at its height, and I participated in consciousness-raising groups, which had popped up all over the country. We were angry, oftentimes bitter. We expressed this in our meetings, as well as in public, and were often at odds with one another and our self-appointed leaders. What I learned from the Conference—from the keynotes speakers, the workshop facilitators, the chaplains, the entrepreneurs and the academics—was that the language of women’s protest has dramatically changed since then. Education, empathy are key. Likewise, the words ”diversity,” “tolerance” and “victim” are out. “Inclusiveness,” acceptance” and “empowerment” are in. Today, studies have shown that women live longer when they bond with other women. There is power in women’s friendships. Feminism is no longer a dirty word; feminism is equality for all. The overarching message is how we, as women, can learn to trust and respect one another—and the Sisterhood of Salaam Shalom does that—to manage the threats of anti-Semitism and Islamophobia together and to fight back with words and deeds. Many thanks to Ann Jackowitz for writing the introduction for this piece.